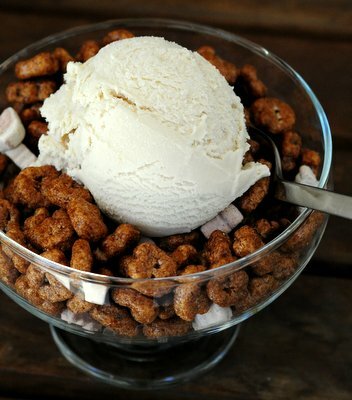 Cereal milk ice cream is exactly what it sounds like: ice cream that tastes like the milk that is left behind after eating a bowl full of cereal, preferably a sugary cereal. 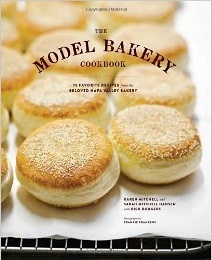 The idea was popularized at Momofuku Milk Bar, where it is made with caramelized corn flakes in milk. I don’t know about you, but as a kid I always thought that chocolate cereals left the best tasting “cereal milk” behind – not cornflakes and other plain cereals that you needed to add your own sugar to. I don’t buy chocolate cereals much these days, but I can never resist picking up a box of Count Chocola when it appears on store shelves around Halloween. It was one of my favorites as a kid and a fun, seasonal indulgence for grown ups who might usually steer towards less chocolaty breakfast cereals. Since that chocolaty milk has a lot more flavor than plain cereal milk, I decided it was a great candidate to be turned int a batch of cereal milk ice cream. 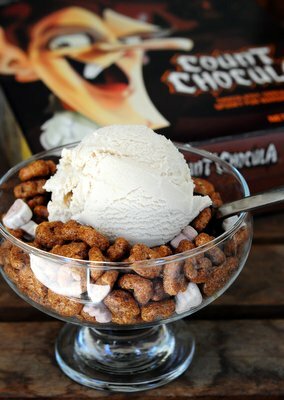 My Count Chocula Cereal Milk Ice Cream is easy to make and has a light chocolate flavor to it that is very reminiscent of the cereal milk used to make it. All you really need to do to get started is soak Count Chocula cereal in milk to draw out its flavor. The wet cereal is then strained out andÂ that milk is used as the base of the ice cream.Â The finished ice cream has a very light brown color and a rich, creamy texture that melts perfectly on your tongue with every bite. The chocolate flavor is subtle enough to win over even people who don’t usually like to drink cereal milk themslves! I honestly thought this ice cream might be more fun to make than to eat. Fortuantely, I turned out to be completely wrong because I liked it even more than I expected to as the cereal turned into a beautiful ice cream. I served mine sprinkled with dry Count Chocola cereal. It added a nice little crunch (and those crispy marshmallows added some additional texture) and highlighted the chocolate flavor just a bit more. You will need an ice cream maker to get the best results, just as you did with my other Halloween-inspired Candy Corn Oreo Ice Cream. In a large measuring cup or bowl, combine 1 cup of the heavy cream with 1 cup of milk, two cups of Count Chocola cereal. 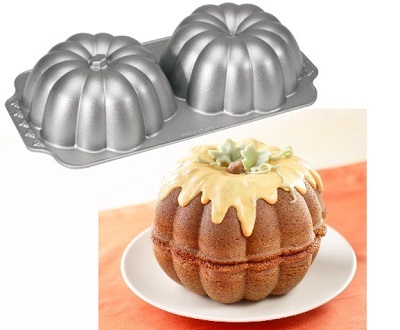 Stir, then cover with plastic wrap and allow mixture to stand at room temperature for 1-2 hours to infuse the milk. Strain out cereal through a fine mesh strainer, pressing the leftover cereal with a spatula to remove excess liquid. You should have 1 1/4 cups liquid (slightly more is ok if you were able to extract extra from your cereal). Stir sugar into strained cereal milk and whisk until it dissolves. Stir in remaining 1 cup of heavy cream. Refrigerate until chilled, about 1 hour. Pour ice cream base into your ice cream maker and freeze according to the manufacturer’s directions. This sounds delicious a good way to use cereal milk!